Nevner hvordan høy-fett høy-karbo forværrer nevropati (ødelagte nerver), men høy-fett høy-karbo høy-salt ser ut til å dempe smertene noe. In the current study, early metabolic syndrome (hyperinsulinemia, dyslipidemia, and hypertension) and prediabetic conditions (IFG) could be induced by high energy (high-fat and high-sucrose) diets in rats which later developed painful polyneuropathy that was characterized by myelin breakdown and LMF loss in both peripheral and central branches of primary afferent neurons. However, SMF and UMF were far less damaged in the same rats. The phenomenon that the high energy diets only induce mechanical, but not thermal, pain hypersensitivity may reflect a selective damage to LMF, but not to the SMF and UMF. 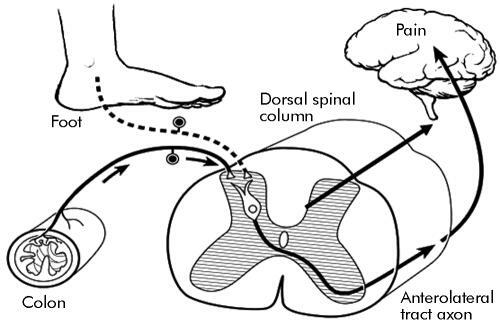 Moreover, dietary sodium (high-salt) deteriorates the neuropathic pathological process induced by high energy diets further, but paradoxically high salt consumption may improve, at least temporarily, chronic pain perception in these animals. We have therefore established a strong link between high-energy/high-salt diet induced metabolic syndrome and prediabetes which results in relatively selective LMF damage in both the PNS and CNS that in turn can result in neuropathic pain. These results have a profound impact on patient welfare relative to diet choice, not just for T2DM onset, but also for its associated neuropathic symptoms. Denne viser hvordan selv de uten diabetes får økt cytokinverdi (betennelse) i blodet i 1-2 timer etter blodsukkerstigning. I denne studien var det snakk om blodsukker over 15 mmol/L. De sier at blodsukker økninger påvirker cytokinnivået mer enn et stabilt høyt blodsukker. Plasma IL-6 levels rose from a basal value of 2.0±0.7 pg/mL to a peak of 3.1±0.9 pg/mL at 1 hour (P<0.01) and returned to basal level at 3 hours (Figure 2). Fasting plasma TNF-α levels were 3.3±1.2 pg/mL; they peaked at 1 hour (4.9±1.4 pg/mL, P<0.01), and returned to baseline at 3 hours. Plasma IL-18 levels rose from a basal value of 116±28 pg/mL to a peak of 140±31 pg/mL at 2 hours (P<0.01) and returned to basal levels at 3 hours (110±26 pg/mL). The novel findings of the present study were that (1) acute hyperglycemia in control and in IGT subjects induces an increase in plasma IL-6, TNF-α, and IL-18 concentrations; (2) the effect of sustained hyperglycemia is reproduced by transient oscillations in plasma glucose and is amplified by the IGT status; and (3) the antioxidant glutathione completely prevents the rise in plasma cytokines induced by hyperglycemia. These results indicate that hyperglycemic spikes affect cytokine concentrations more than continuous hyperglycemia, at least in the short term, and suggest that an oxidative mechanism mediates the effect of hyperglycemia. En viktig artikkel fra forksning.no om at maks 40% er grensen før karbohydratene aktiverer betennelser i kroppen. Etter bare noen dager med 30% karbohydrater begynner livsstilssykdomsgener å skri seg av. Hyperglycemia enhances the cytokine production and oxidative responses to a low but not high dose of endotoxin in rats. Denne beskriver hvordan hyperglycemi (regnes som blodsukker over 7 mmol/L i lengre perioder, eller fastende blodsukker over 7) gir økt cytokin-aktivitet i flere timer etter en stressende episode. Om man spiser en snickers går blodsukkeret opp til over 10, og om man kontinuerlig spiser mat som øker blodsukkeret er det en stor sjangse for at man har en kronisk betennelsesreaskjon med økt cytokin aktivitet. The aim of this study was to investigate whether hyperglycemia enhances the systemic inflammatory response and oxidative stress induced by endotoxin. A hyperglycemic condition was produced in rats by glucose clamp for 3 hrs. Immediately on stopping the glucose infusion, animals received different doses of endotoxin injection (0, 0.2, or 1 mg/kg), and then blood glucose concentration was monitored over the ensuing 2 hrs. At the end of 2 hrs, levels of tumor necrosis factor-alpha, interleukin-1beta, interleukin-6, corticosterone, and alpha-1 acid glycoprotein were determined in serum, and malondialdehyde and total glutathione content were determined in the liver. Over the 2-hr period, blood glucose concentrations returned to normal in initially hyperglycemic rats. However, the levels of cytokines, corticosterone, and alpha-1 acid glycoprotein were significantly higher in these animals compared with nonhyperglycemic controls, demonstrating an extended effect of prior hyperglycemia on markers of systemic inflammation. With low-dose (0.2 mg/kg) but not high-dose (1 mg/kg) endotoxin administration, hyperglycemic animals had significantly higher levels of cytokines compared with controls, indicating that prior hyperglycemia can enhance the systemic inflammatory response to a moderate endotoxin dose, but that the maximum effects of endotoxin on production of inflammatory cytokines are not altered by transient high glucose exposure. Systemic inflammation persists for a period following hyperglycemia, and this can enhance the systemic inflammatory response to a subsequent moderate stress. These data demonstrated that a Mg intake of 10% of NR in rats causes bone loss that may be secondary to the increased release of substance P and TNF-α. Denne nevner hvordan tiltak som reduserer SP bidrar til å redusere de negative virkningene av magnesiummangel. Neurogenic Inflammation and Cardiac Dysfunction due to Hypomagnesemia. Significant protection against most of these MgD-mediated events has been observed with interventions that modulate neuronal SP release or its bioactivity, and with several antioxidants (vitamin E, probucol, epicaptopril, d-propranolol). In view of the clinical prevalence of hypomagnesemia, new treatments, beyond magnesium repletion, may be needed to diminish deleterious neurogenic and prooxidative components described in this article. Denne nevner hvordan SP er involvert i insulin regulering og diabetes. Our results demonstrate an important role for SP in adipose tissue responses and obesity-associated pathologies. These novel SP effects on molecules that enhance insulin resistance at the adipocyte level may reflect an important role for this peptide in the pathophysiology of type 2 diabetes.